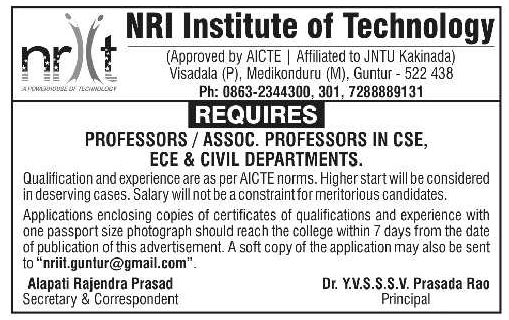 NRI Institute of Technology, Guntur has advertised in the EENADU newspaper for recruitment of Professor / Associate Professor jobs vacancies. Interested and eligible job aspirants are requested to apply within 07 days from 19th March 2019. Check out further more details below. About College : NRIIT is located away from the hustle and bustle of the city life in a scenic and serene environment spread over an expansive 10.9425 acres amidst the lush greenery of mirch and cotton fields of Visadala Village just 9 kms away from Guntur, the major city of the capital region of Andhra Pradesh. The institute has set a benchmark in providing its students the very best in terms of infrastructure and faculty. The college meticulously implements quality policy. How to Apply: Interested and eligible candidates are requested to send CV along with all copies of certificates / testimonials, copies of PAN card / Aadhaar card and recent PP size photos to the postal address and also email address provided here.